Soon my husband and I will be taking a trip to Israel to visit his family, and I am beyond excited for all the Middle Eastern feasting I’m about to embark upon. One of my absolute favorite Middle Eastern recipes is a Moroccan Eggplant Salad that my mother in law makes. OMG, is it good. I go crazy for it. And every time I visit her or she visits me, she makes me a batch, and of course, I devour it within minutes. For months, I have tried to create a healthier version of her original recipe — she fries her eggplants in a lot of oil, thus making it not so Weight Watchers friendly. After many failed attempts, I finally got it. My mistake was trying to eliminate the oil. Because the eggplant is so spongy and porous, there just absolutely must be some oil, or it doesn’t work. Bu instead of frying them, like my mother in law does, I baked them, and then added in a lot less of the oil later. It worked very well, and even my picky husband thought that I had gotten pretty darn close to her version. So in my Moroccan Eggplant Salad, each serving is just 2 Points, and the flavors are fantastic. Of course, I will always prefer my mother in law’s version over my own, but when I can’t eat hers, I can enjoy my healthy alternative and satisfy my craving for it. Dina, if you’re reading this…I’m coming….get those eggplants ready!! This delectable, yet low calorie side dish recipe will put a boring green salad to shame. Incredibly flavorful and savory, the smoky roasted eggplants and peppers are perfectly highlighted by the tangy vinegar and garlic. Truly one of my all-time favorite Weight Watchers Recipes. Line a large baking with parchment paper and mist with a non-fat cooking spray. Evenly spread out eggplants and pepper rounds. Lightly mist them with an olive oil mister or nonfat cooking spray, and then generously sprinkle with salt (I used about a 1 tsp and a half). Roast in oven until peppers and eggplants are cooked through and charred well, about 25-30 minutes. Flipping over once about halfway through. Remove from oven and let cool four about 5 minutes. 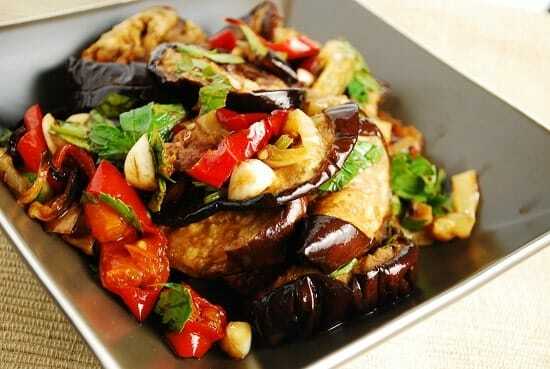 In a large bowl, combine the roasted eggplants and peppers with the remaining ingredients. Stir well to combine, and then store in an airtight container and refrigerate overnight. I just did for shabbat came out amazing may hashem bless u.
I was looking for a really special Middle Eastern Eggplant dish to do for the Global Shabbat of this past weekend 24/25 October 2014. I came across this Moroccan Salad, made it…tasted it…and all I can say is….IT’S SO INCREDIBLE I and my friends want to eat it every day!! Do you serve this hot, cold, or either? Hi, Do you have a good recipe for taboule (sp)?? Thanks! Oh my gosh. I made this and it was fantastic. Everyone loved it. Thank you for a great recipe. Next time I will double it!! I can’t wait to make this! I love all your recipes! Thank you so much for a great site! I love how you skinny all these great recipes down . My mother in law is Middle Eastern too, and her food is divine!! It’s funny, she and my sister in laws are all tiny , yet the food is fried and lots of rice.. Have an amazing time in Israel;there is nothing like Israeli sephardic food.. Thanks! Yeah, I think I’m more excited about the food than seeing the family :).